Adapting City Connects for preschool classrooms took careful thought. In 2009, City Connects received funding from the Better Way Foundation to implement its model in early childhood programs in Catholic schools. In 2012, City Connects was set up at Catholic Charities’ Nazareth Child Care Center, a freestanding early child care center in Jamaica Plain. 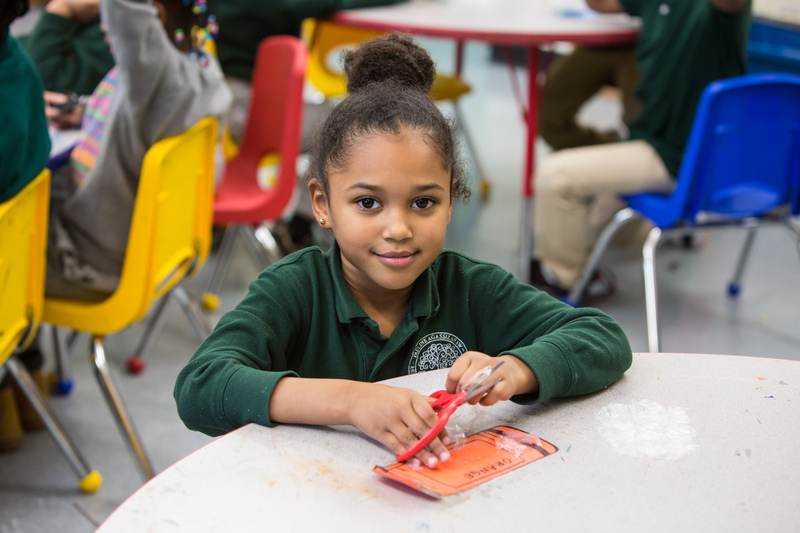 Currently, City Connects is in early education settings in five states, a total of 38 public school classrooms and 19 Catholic school classrooms. The core City Connects practice is the same whether it’s done in preschools, grade schools, or high schools: There’s a whole class review of every student, and each student is assigned to a tier that indicates the intensity of the interventions that he or she will receive. What makes City Connects distinctive in early education settings is a heavy focus on families and on young children’s developmental milestones. To better gauge needs, Cigna developed new intake forms that ask about everything from family structure, custody issues, and behavior to bedtime routines, health screenings, motor skills — such as zipping, buttoning, and hopping — and whether children have televisions or computers in their rooms. Children who need more intensive services get Individual Student Reviews (ISRs), which are conducted by key stakeholders, a group that could include school psychologists, teachers, principals, nurses, and occasional community agency staff members. The review is typically led by a City Connects Coordinator. While City Connects links children to services located in their communities, interventions with young children are often based in preschool classrooms. This could mean setting up a social skills group, a small group where children can learn about sharing or working with peers. For one child who was struggling in preschool, it meant asking the teacher a crucial, strengths-based question: What does the child like to do? At first the teacher couldn’t say, but after some thought, the answer came: Legos. So, Legos became a point of intervention. The child was offered the chance to play with Legos with a peer that the child chose. This created an opportunity for the Coordinator to join the children and model sharing, positive social skills, and the appropriate use of language. It was also a way to support the preschool teacher. “You have to have that conversation about children’s strengths,” Cigna says, because that’s how you find a door into their lives. It’s easy to look at a child and say that he or she is just disruptive, Cigna adds, asking, “But is that really true?” Or are there underlying issues such as health care challenges or trauma at home that a very young child lacks the vocabulary to describe? “We pick up a lot by assessing hearing loss,” DiNatale says. “It’s not that the child is deaf, it’s that the child isn’t hearing voiceless sounds,” such as the sounds of the letters p, s, and t. “And then we know that’s going to affect their ability to learn phonics.” City Connects Coordinators will then support parents to work with pediatricians to drain built-up fluid from children’s ears, and coordinators also work on creating environments that are more sound sensitive. As they do their work in preschool settings, coordinators also use an observation checklist that’s divided into three topics: physical space/environment; classroom procedures and routines; and teaching strategies. The goal is for preschool classrooms to provide engaging environments where the rules and expectations are clear, and where teachers are using academic and social-emotional strategies that are age-appropriate and effective. Coordinators work with teachers to develop SMART goals for children – goals that are specific, measurable, attainable, reasonable, and timely. “We want to create a goal of what we want this child to accomplish,” Cigna says, rather than fixating on what a child should NOT be doing. It’s hard work that must be done with care for every child, but the payoff is huge. Using a structured, systematic approach to respond to each child enables City Connects to provide services and enrichment opportunities that are both consistent and personalized. Coordinators follow up to check and see if interventions are effective. And because City Connects collects data, Coordinators can see how children are doing over time. “If we can respond now, children may have fewer learning issues later,” Cigna says. And that single fact could unlock doors that lead children to lifelong success.